Get your ZMR X210 Frame from FPVModel. The frame was built by SiRDoGG8u. First thing that I noticed during unboxing was how well the mini quad frame was packed. All carbon parts were packed separately so there was no way for the carbon to get scratched, All hardware was in different bags, which made it easy to sort the screws needed for the build. I do like to say I am very impressed with the carbon and how it looks, with no jagged edges. 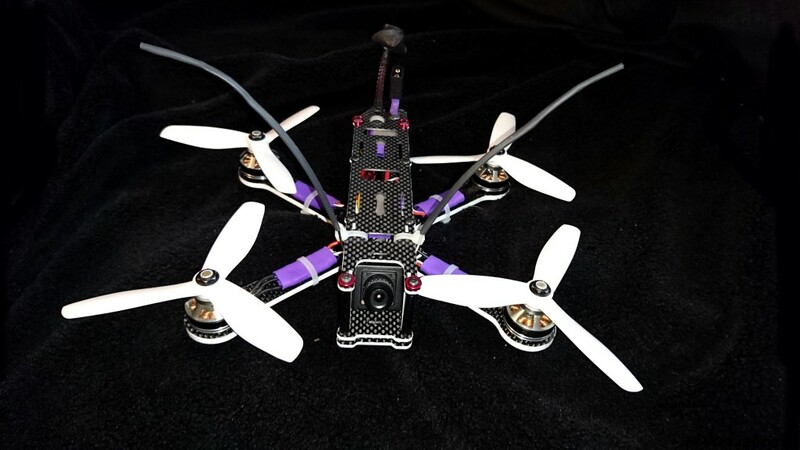 Weight: 97g carbon fibre parts without hardware – 145g assembled. One great feature is the what I would call “Quick Release Fixings” aluminium mounting hardware, it allows you to swap out arms more quickly. Basically they are threaded spacer that are shared by multiple bolts, when you unscrew one bolt the spacer will still be supported by other bolts and stay where they are, therefore you only need a screw driver and no pliers required. You don’t even need to remove the top plate to change arms any more. the centre fixing for the arms wouldn’t screw into mount, after examination and removing the arms, i found the mount that holds the middle screws for the arms, the holes didn’t line up (below picture). So without getting the Dremel out to drill the carbon and make the holes too big I scrapped the mount, and just used M3 locking nuts , only issue with doing this is you can’t do a quick swap if you break an arm, so that is the first negative point I found , hopefully they will sort this out soon. They have done a nice touch with the spacers that are used between the 2 bottom plates: the spacers are threaded, and you don’t lose the screws and spacers, when the standoffs are removed for any reason. The ZMR X210’s arms are sandwiched by a double bottom plate structure like the good old ZMR250. However on this design you can optionally use only 1 bottom plate to save weight, the trade-off would be reduced strength against crashes. Comparing to the good old ZMR250 arms. Similar to the DemonRC NOX5, you get 2 different options of FPV camera mounting. This is the for cameras with a case. And the mounting plate is for board cameras. Finally after fully building the ZMR-X210, I found the 2nd mistake to this frame. I painted the edges of the carbon fibre with white colour “Tyre Marker”. You can also use nail polish but tyre marker is easier IMO. I had to use washers as I never had M3 screws that was short enough. The next issue I had was when installing the motors to the arms (t-motor 2204/2300kv) I found that you have to be perfect with the lining of the shaft as the C-clip rubs the whole drilled in the arm. But with cobras and many other motors that should not be an issue. After that the frame was a joy to build with no other problems, the frame is nicely designed and has some similar looks to the Lumenier raceblade. No where near the same but some nice touches and detail to attention on this frame. Here is a test flight. I just built one a few days ago, the issue with the center plate not fitting and with the spacers was solved – all went together smoothly. Great thanks for letting us know! FPVModel was curious that the sample they sent us was still having this problem, as they thought they fixed it before sending it to us :) probably just from an old batch! not sure if you have already reviewed the QAV-R but any chance you know if the zmr-x210 has the same mounting holes as the arms on the raceblade? I would love to be able to mix and match the arms so i could have one quad with 3 different configurable sizes. Can you compare it to the QAV210? I’m using this badass frame. All the mentioned issues here were already fixed during the new release 2 weeks ago, the standoff are now thread deep enough that even long m3 screw can get it. and I think you were missing one part of the frame (the center 4-hole-square aluminum bracket) -the quick arm release is really possible. unfortunately the one they sent us, less than 2 weeks ago, still shows these issues… maybe they just sent us the old batch not sure. I love this frame. Can you post your P.I.D I would like to compare. Thanks for doing all of these frame reviews! I’m soon to be in the market for a new frame, and it’s great to see a bunch of options! thank you for your very informative tutorials. I ordered a x210 ZMR at FPV model in ARF I receive soon . How did you paint the slices of white frame ? It is original because it is very beautiful . So, what setup (esc, motor & cam) are you using ? And what would you recommend after the first flights ?